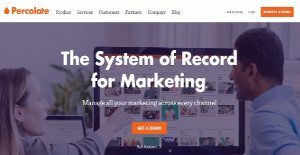 Percolate is all-in-one marketing software used by top marketing service providers worldwide that allows management of marketing across all channels, and a one-stop solution to plan, create and execute it. Software’s planning and campaign management features allow effective and efficient coordination of marketing across all markets, channels and teams. The content marketing and asset management features provide a robust platform for content inspiration, distribution, management, analysis and more. The integrated task management system makes it easy to track work from start to finish. Percolate also allows publishing content to different marketing channels from a single hub including social, digital and traditional marketing channels. Marketing Analytics is also a great tool to measure marketing from idea generation to execution allowing to effortlessly track team productivity, cross-channel visibility, richer insights into content performance and highlighting areas that require improvement. Percolate aims to save marketer’s time, elevate their content and enhance marketing ROI through its four core modules i.e. Planning and Campaign Management, Content Marketing and Asset Management, Distribution and Social Relationship Management and Marketing Analytics. Percolate eliminates the need of working and updating spreadsheets and emails, saves time and effort by keeping everyone informed and brings teams together for efficient planning and content management. Every marketing activity is visible whether it is a global initiative or an individual piece of content. All marketing activities and campaigns can be planned on a single calendar, which can be filtered by team, location, topic, channel and so on. Percolate allows content teams to work faster and smarter by turning content into great customer experiences and sales. Creative workplace is a hub to develop content with ease and also offers custom templates so that the users do not have to rely on designers for every single creative task. The enterprise-grade approval system ensures oversight on all the content and the task management system seamlessly tracks work from start to finish. The software makes it easy to distribute content to a number of channels and scale global campaigns. Channels include social media websites, marketing automation, blogs and even custom destinations. Its flexible APIs even allows publishing to new channels so users can connect with customers whenever they need to. Analysis is one of the most important areas of any marketing software and Percolate allows cross-channel visibility, rich insights about performance of the content, team productivity tracking and areas of improvement. The reports can also be generated and shared seamlessly. Since each organization has unique business requirements, it is advisable for them to abstain from looking for a one-size-fits-all ideal software application. Needless to say, it would be futile to try to find such a system even among market-leading software applications. The intelligent thing to do would be to catalog the various important aspects that need consideration such as key features, finances, skill levels of workers, company size etc. Then, you should do your groundwork thoroughly. Read some Percolate reviews and check out each of the other apps in your shortlist in detail. Such exhaustive research can ensure you weed out ill-fitting platforms and select the solution that provides all the features you need for business success. How Much Does Percolate Cost? We realize that when you make a decision to buy Marketing Software it’s important not only to see how experts evaluate it in their reviews, but also to find out if the real people and companies that buy it are actually satisfied with the product. That’s why we’ve created our behavior-based Customer Satisfaction Algorithm™ that gathers customer reviews, comments and Percolate reviews across a wide range of social media sites. The data is then presented in an easy to digest form showing how many people had positive and negative experience with Percolate. With that information at hand you should be equipped to make an informed buying decision that you won’t regret. A great tool for implementing the things we want. A solid platform that we really wanted from the get-go. An ideal platform intended for scheduling social media armed with great approval workflows. A digital marketer's dream to convert things to reality. What are Percolate pricing details? What integrations are available for Percolate? Pros: Whether it's dealing with customized watermarks to searching content with clients, Percolate, in itself, is a league that no other platfomr like it can reach. It converts brands to publishers. You seldom see a platform like it that functions efficiently. It's able to add management and professional-looking content. And that can really help you go a long way. Cons: Percolate can be challenging for clients who fail to its immediate impact. It's very slick to begin with and could easily be deployed in any agency dealing who wants a solution for lots of legwork. Percolate would've been more cost efficent as a result of the time we were able to save via implementation. Pros: Percolate is so simple when it comes to syncing social channels and posting on every single one. Scheduling capability is awesome in planning a number of posts for multiple weeks at a time. Setting up approval workflow was one main factor for my company. We needed some kind of legal approval before putting up any content. Marking each of post with our workflow and entailing approval from the right party before doing any publishing is win-win for us. Cons: Whenever a post is sent for approval for a specific workflow, there's no chance for editing or changes to be made. At times, we ended up doing changes and resubmitting a post for proper party approval. We'd start right back from scratch and remake the post since no changes were seen in the workflow. Another problem that I ran into was, if we miss out on publishing a post, it goes directly to draft mode. This is a bad thing sincs it's pushing us to funnel to the right tab, look for it, and make edits/changes.